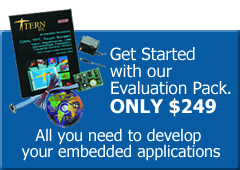 The OPS is designed for data-acquisition, control, or test applications that require analog signal conditioning circuit to provide high input impedance, high gain, low noise to low-voltage output sensors, such as EKG electrodes, thermocouples, and strain gauges. Most standard ADC inputs are 0-5V. If you need to interface low-voltage output to ADC input, or if you want to amplify low voltage analog signal for output, OPS is the little analog signal conditional circuit board for you. Measuring 2.8×2.4 inches, the OPS has 4 channels of instrumentation operational amplifiers with high input impedance (up to 100MO) varied by a single resister, and differential inputs. The CMRR, ratio of differential signal gain to common-mode signal gain, is typical 70db. The high input impedance adjustable-gain differential amplifier is constructed with three operational amplifiers. Two operational amplifiers are operated in the no inverting mode. The input impedance at each input pin of the differential amplifier is the common-mode input impedance of the OP chips, depending on the type of OPS used. For example, the input impedance of LM324 (default) is typical 2M. You can upgrade the op-amps to the LT1014, which has input impedance of 300M. The CMRR is typically 110db for the LT1014. Depending on jumper settings, it can provide output as either voltage or current, and can operate with or without filter. 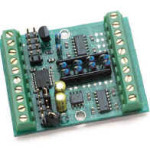 The OPA is a similar expansion board that provides integrated 16-bit ADC.